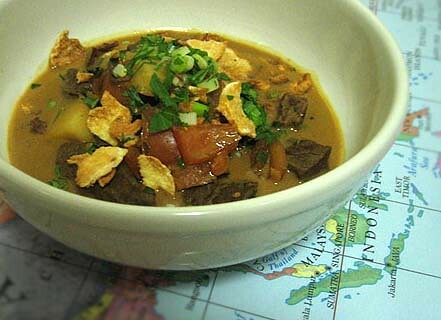 The Betawi are the descendants of the people living in Jakarta and soto translates to soup. Soto Betawi is traditionally made with offal but Thalia’s recipe is a tamer version, just perfect for New York’s current dipping temperatures. The tamarind marinade made this soup a little sour with the tomatoes and the lime, which I loved, but I also added extra spices to give it a little more kick. I browned the beef first for some color and I just used the separate beef stock I had saved in the freezer. While the stock was simmering, I quickly deep-fried the emping melinjo crackers I bought from Chinatown. They added a nice crisp to the nutty-sour flavor of the soup. I think Thalia would have been proud. 1. Prepare a day before: tenderize the sirloin beef by pounding with a mallet on a wooden block. In a small bowl, combine tamarind concentrate with sugar and salt to make a paste. Marinate beef in the fridge overnight. 2. When ready to cook, boil potatoes in a pot of water. In the meantime, cut beef into small cubes. In a pot with hot oil, sautÃ© bay leaf and shallots and brown beef on all sides. When potatoes are done, drain and lightly brown in the same pot. 3. Add beef stock and simmer. Stir in coconut milk. Add tomatoes, cumin, turmeric, lemon grass, lime juice, chilis and salt and pepper to taste. Simmer for a few more minutes until beef cubes are tender. 4. To serve, put some of the meat and vegetables in a bowl first. Ladle broth and sprinkle with scallions and cilantro. Crush crackers on top. Squirt with leftover lime juice and stir in some kecap manis to taste. Have you ever had Burmese fermented tea salad? IT IS AMAZING!